(Phys.org)—One thing that all chemical reactions have in common—whether they are the reactions that take place inside a battery, the metabolic reactions inside a living organism, or the combustion reactions that cause an explosion—is that they all involve some kind of change in energy. On a large scale, the changes in energy of a reaction can usually be measured in various ways for practical purposes, but attempting to understand the fundamental origins of this energy at smaller and smaller scales becomes more complicated, especially as chemistry enters the quantum realm. In a new study, Cornell University chemists Dr. Martin Rahm and Prof. Roald Hoffmann (who received the Nobel Prize in Chemistry in 1981 for theories on the course of chemical reactions) have explored a new way of understanding the origins of energy in chemical reactions at the quantum level. Their paper is published in the Journal of the American Chemical Society. At the heart of the paper is the idea—which is generally widely accepted in chemistry—that all of the interactions between the molecules, atoms, and the electrons that bind atoms together can collectively be understood in terms of energy. However, the origins of this energy, and how the energy changes during a chemical reaction, remains an open question. Over the years, researchers have proposed various "energy decomposition analyses," or interpretations of how this energy can be broken down. In their paper, Rahm and Hoffmann propose a new energy decomposition analysis in which the total changing energy of any chemical reaction can be broken down into three components: nuclear-nuclear repulsion (the repulsive energy between the positively charged nuclei of different atoms), the average electron binding energy (the average energy required to remove one electron from an atom), and electron-electron interactions (the repulsive energy between negatively charged electrons). To paint a picture of how this works, the scientists explain in their paper what happens when any two atoms are brought closer together. First, the repulsion between the two nuclei increases, which causes the electrons to move in between the nuclei in an attempt to shield some of this repulsion. In the presence of the two nuclei, the average binding energy of the electrons changes due to differences in electron-nuclear attraction. As the electrons move closer together, they also begin to interact more strongly with each other. Quantifying these electron-electron interactions is one of the greatest challenges in computational chemistry. One thing that this work demonstrates is that it is possible to estimate these electron-electron interactions (the third term) from experimental data. As the scientists explain, this is one area where chemistry becomes "quantum," and has not been measurable before now. 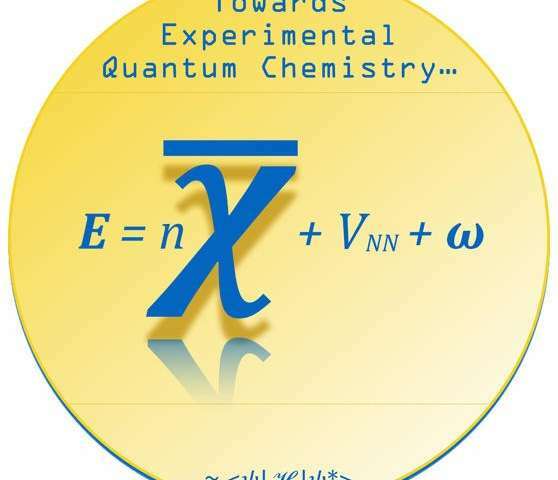 "Traditionally, knowledge of electron-electron interaction energies has only been attainable by first mathematically constructing a wave function and then approximating a solution to the so-called Schrödinger equation, i.e., by doing quantum mechanics," Rahm told Phys.org. "This work demonstrates that such information can actually be extracted from sufficiently accurate experimental data. There are caveats and inherent approximations, but it is in principle possible." Other new possibilities arise from understanding the second term—the average electron binding energy—as an alternative interpretation of one of the most fundamental concepts of chemistry, that of electronegativity. As the scientists explain, electronegativity was traditionally defined by Linus Pauling in 1932 as "the power of an atom to attract electrons to itself," and in this way it tells where electrons move when two or more atoms come together, which is the basis of bond formation. This is still the most widely used definition today. An alternative definition, proposed in 1989 by Lee Allen, is that electronegativity is the average binding energy of valence electrons (however, Rahm and Hoffmann use all of the electrons, not just the valence ones, in their energy partitioning proposal). 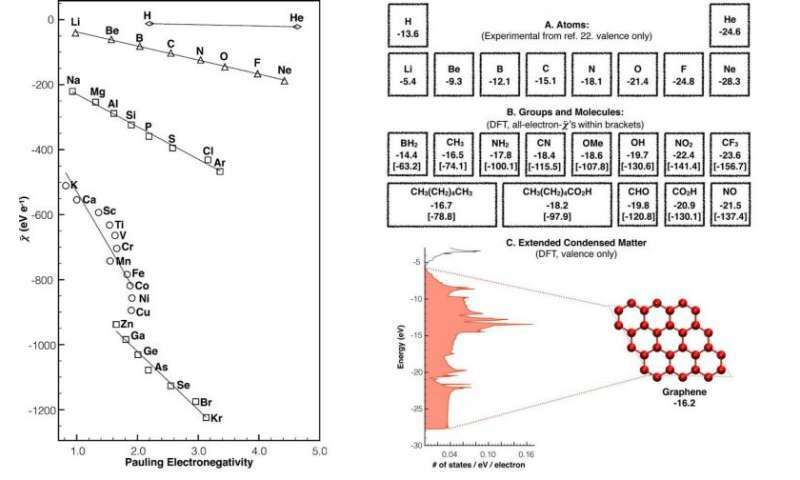 Electronegativity values obtained using Allen's definition correlate strongly with those obtained using Pauling's, but the main advantage of Allen's definition is that electronegativity defined in this way can be experimentally measured (such as by using photoelectron spectroscopy), while electronegativity using the Pauling definition cannot be. The ability to experimentally measure the average electron binding energy, along with the fact that experimental data can be used to determine nuclear-nuclear repulsion and electron-electron interactions, provides some unprecedented abilities. Most importantly, it makes it possible to experimentally measure what percentage of the total energy change that each of the three components is responsible for. With this information, the scientists explain that all chemical reactions and physical transformations can be classified into eight types based on whether the reaction is energy-consuming or energy-releasing, and on whether it is favored or resisted by the nuclear, multielectron, and/or binding energy components. This information can provide valuable information about the nature of a chemical bond. The researchers also showed that, in four of the eight classes of reactions, knowledge of the binding energy alone (and by extension, either definition of electronegativity) is enough to predict whether or not the reaction is likely to proceed. In other words, as the scientists explain, "it allows researchers to predict when simple and intuitive rationales using the time-honored concept of electronegativity will work in predicting trends in energy, and when it will fail." This paper is the first in a series in which the researchers plan to explore these ideas further, especially in regard to the potential usefulness of this new perspective of energy in chemical reactions. They note that one "tantalizing" prospect is the possibility to measure absolute energies, whereas most of chemistry relates to the measure of relative energies. An experiment would begin with the known measured absolute energy of a one-electron system (such as C5+, which is a carbon atom with all but one of its electrons removed), which can easily be measured since, with only one electron, there is zero electron-electron repulsion. Then the absolute energy of the carbon atom, and the electron-electron interactions within it, could be measured as electrons are added back one by one. This feat should be possible since it's in principle possible to experimentally measure the average electron binding energy for each step. In this way, an alternative understanding of the fundamentals of chemistry may provide useful new tools and applications. "This paper has three important outcomes," Rahm said. "It connects the central chemical concept of electronegativity with the total energy, whose changes govern most of chemistry. It tells us how we can estimate the importance of electron-electron interactions in governing chemical reactions, from experimental data. It is also the first energy decomposition scheme that can be interchangeably applied using either or both computed and experimental data. This should allow for quite some interdisciplinary bridging." In the future, the scientists plan to apply this theoretical understanding to studying a variety of chemical reactions. "The next step will be to analyze the nature of the chemical bonds in larger diatomic molecules, such as molecular nitrogen (N2), carbon monoxide (CO) and fluorine (F2)," Rahm said. "After this, more complex reaction mechanisms and physical transformations will follow. Such work will show us the limits of our approach. Hopefully useful predictions will emerge that could, ultimately, help us understand and design different molecular and material properties." Re: "...the metabolic reactions inside a living organism..."
Schrodinger's link from the sun's biological energy and quantum physics to Dobzhansky's link from quantum biology to amino acid substitutions that differentiate the cell types of gorillas from those of chimpanzees and humans will require consideration in the context of a model that links atoms to ecosystems via the conserved molecular mechanisms of biophysically constrained nutrient-dependent RNA-mediated protein folding. Thank God, there's a model for that. ...chemistry is about redistribution of charge so you can see why ignoring that is a problem). Agreed, so when do you think others are going to stop ignoring the problem of virus-perturbed nutrient-dependent energy? It's not valuable research if it cannot be placed into the context of testable theory. Excerpt: "The imprimatur of science should be awarded only to a theory that is testable. Only then can we defend science from attack." It will be interesting if we could one day find the way to exploit that binding energy, to storage energy. Reverse the process somehow. For example if we need to brake bonds between carbon atoms in carbon nanotube or graphene in general we need to supply quite a lot of energy. If somehow we could create electric battery battery that could use equivalent of this energy, capacity should be incomparable to any existing batteries. thus far, your ability to comprehend science is horrendous! my 13 y/o granddaughter knows better than you as she has a lot more education in the medical field, being the daughter of a nurse and in the BioMed program already! What exactly is your reason for linking SciMag? do you think it supports your non-mutation creationist ideals? Excerpt: "...researchers have learned that production of both hormones depends on the same rate-limiting enzymes. And Jerome Hui of the Chinese University of Hong Kong found that in both insects and crustaceans, the same set of micro RNAs control expression of the genes for those enzymes." The links from nutrient-dependent microRNAs to the stability of all organized genomes via the physiology of reproduction are perfectly clear to everyone who is not a biologically uninformed science idiot. What don't you understand about the need to eat to survive and reproduce? It will be interesting if we could one day find the way to exploit that binding energy, to storage energy. It would be interesting to discuss the "fifth force" in the context of binding energy that appears to untangle quantum entanglement and link the sun's biological energy, which is slowed on contact with water, to the UV light-induced de novo creation of nucleic acids and Schrodinger's ideas in "What is LIfe" to what is known now. Viruses perturb the communication, which is why they are linked to pathology by the mutations they cause. Do you not understand the links from this article to the other one? you have a 100% fail rate when authors take the time to read your pseudoscience and actually respond. there are some who actually simply responded with "I don't argue pseudoscience with those who refuse to accept validated data"... much like most authors starting statements that have responded, but explained. so... clear the air, tell everyone WHY YOU THINK the articles are related and how they are related! or shall we just ask the authors again? or is it because of your intentional fundamentalist religious proselytizing?